I've been expecting an updated chart out of the Advanced hydrologic Prediction Service but there haven't been any new charts since February 28th. Since that's still newer than my last update let's dive into the data. The chance of flooding is clearly up. There's now about a 98% chance of the river cresting in St. Paul at or around 20 feet. That would be in the purple "major flooding" zone. What is particularly interesting about this year's predictions is that all probabilities are in the purple zone. 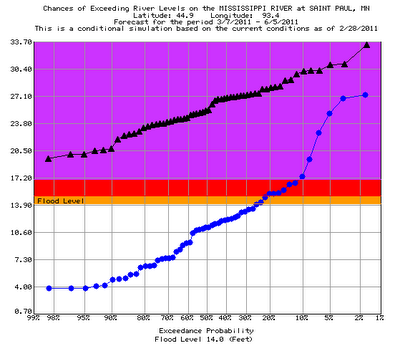 In other words, St. Paul is headed into the major flood stage one way or the other. Portions of Lilydale park go under water at 14 feet, Harriet Island starts to go under at 17.5 feet and portions of Warner Road are under water at 18 feet. It looks like all of those things are a certainty this year. There's a 50% chance of reaching 25 feet and only about a 4% chance of the waters topping the 31 foot levees in St. Paul. When will it come though? There's a graph for that too. Here's how to read the graph. Everything in gray is pretty much a certainty (greater than 90% probability) Blue is 50 to 90% probability so still very good. Red is the outside probabilities of 10-50%. 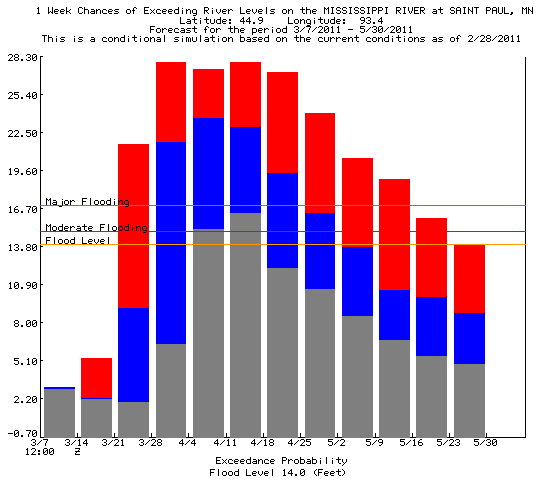 Using this info we can see the blue line jumps into the flood zone the week of March 28th though there's a slight chance of seeing flood stage the week before that. Moderate flooding becomes nearly a certainty the first week of April. According to this graph (which is almost three weeks old.) The highest probability of major flooding comes the second week of April. We're getting a lot of snow melt though so we'll see if an updated forecast pushes that crest earlier. One thing to keep in mind is that St. Paul crests a lot later than other locations upstream. If you want to be sure to get the latest updates and predictions be sure to sign up to receive Twin Cities Naturalist in your email inbox.